Size: 18.5" x 4" x 3"
Argillite is a rare black silt stone that was first used by the Haida to carve pipes and later totems. 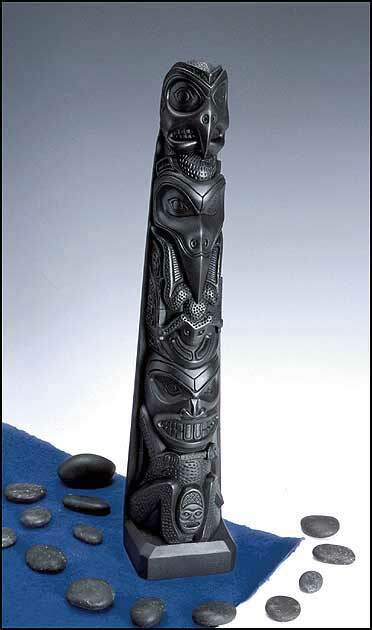 This reproduction of an argillite totem tells the story of Beaver, Raven and Frog. Figures that make up a totem have their own story, and it is the largest figure, generally at the base, that is the most significant. The Raven is the ever-transforming trickster. Powerful, ever hungry, overcurious, he is compulsive, crooked, corrupt and deceptive but somehow likable. The owl at the top represents the artist who carved the totem.